New Wine into Old Skins. A long-awaited event happened the other day — Intel announced at IDF the microarchitecture of IA-32 (x86) processors of the next generation. 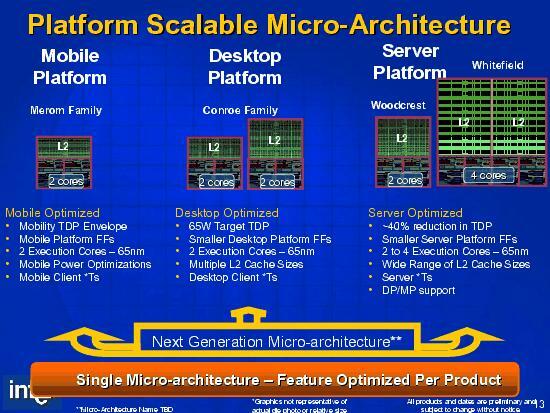 The new microarchitecture will be the same for all the three classes of processors: mobile, desktop, and server. The key distinguishing features of the new processors are dual cores, EM64T (x86-64) support, active usage of power saving technologies and introduction of Star Technologies (*Ts), streamlined in the latest versions of Pentium 4 and Pentium M processors. The first versions of the new processors — mobile Merom, desktop Conroe, and server Woodcrest — will appear on sale in the second half of 2006. Being a votary of the aggressive advertising policy, Intel has tried to present characteristics of its new processors in the most spectacular form. This time the corporation decided to use the Performance/Watt ratio compared to the previous processors as its trump card. Of course, this ratio misleads the readers — but it can still give a general idea of CPU performance. What urged Intel to design a new architecture? The main reasons are obvious: excessive increase of power consumption (and heat dissipation as a result) of Pentium 4 processors, the consequent fashion for economic processors, the halt of the evolutional clock growth that made engineers design dual core processors and introduce them first to social consciousness and then to the open market. Besides, we can probably add to the list such an unobvious factor as the dislike (economically justified!) of software developers to optimize their programs for modern high-frequency microprocessors. As a result, these programs don't get the expectable performance gain from the key architectural innovations in CPUs (it concerns the Pentium 4 processor in the first place). What is the new architecture based on? That's the most interesting question, generating a lot of subjective interpretations. 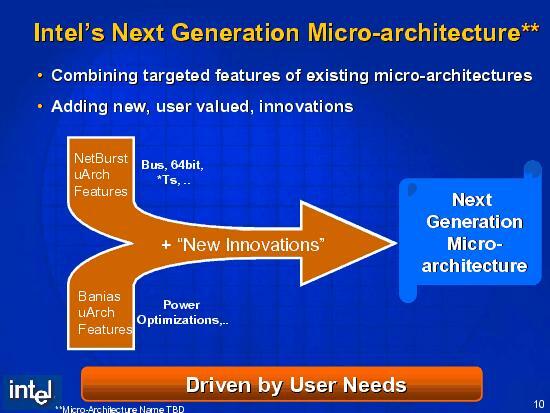 Have a look at the presentation slide below, you will see that the new architecture is allegedly equally based on the previous two architectures: NetBurst (Pentium 4) and Banias (Pentium M). However, the list of key elements on the slide, borrowed from these architectures, is too short. It includes only such elements as 64 bit, Star Technologies, power optimizations, and bus; it does not include the main micro architectural features. That's why it seems hard to point out the true "ancestor" of the new architecture. However, it's clear enough that NetBurst (Pentium 4) is not the direct "father" of the new processors — otherwise, its key advantageous characteristics would have been certainly included and highlighted. Hence the question: is the new architecture a heir to the old good Pentium III processor (from the dynasty founded long ago in 1995 by the Pentium Pro grandfather), or is it actually a new architecture, even if based on the key principles of P-III? Is it a step back or a step forward? In order to answer this difficult question, we'll have to have a microscopic examination of those characteristics of the new processors, which were scarcely published in the presentations, and analyze the key peculiarities, advantages and disadvantages of the supposed predecessors — the two related Pentium III and Pentium M processors. Of course, it's not that important whether we come to a conclusion that the Conroe processor is an overhauled version of Pentium M, or we decide that it's a brand new processor, which had been designed from scratch, but had been filled with previous solutions. The main objective is to understand on what tasks the new processor will outperform the current CPUs and on what tasks it will fail. It's not that relevant whether our readers come to a conclusion about a step backward and two steps forward, or they decide that Intel is making no headway. Time is an ultimate judge. OK, let's make an assumption that the new microarchitecture is mostly based on Pentium M (and its immediate predecessor - Pentium III) and does not contain such principal NetBurst elements (Pentium 4) as Trace-cache, Replay, augmented clock, Hyper-Threading, etc. Of course, many assumptions and conclusions are an expression of a subjective point of view of the author and thus may be wrong (especially quantitative estimates). The Pentium III processor will stand as P-III and Pentium M — as P-M. We shall review the desktop Conroe as a representative of the new architecture - the most oriented to maximum performance for certain tasks. Let's see what is said about the new microarchitecture in the IDF presentation. The "execution width" is increased from 3 to 4, that is four x86 instructions can be now decoded per clock, generating up to four micro-operations (MOPs) The other data paths have been enlarged correspondingly, including Retirement Unit. It is the most important expansion, it must require complete redesign of a processor (preserving its general idea and structure where possible). The effective length of a pipeline is increased to 14 stages. It usually means the pipeline length of an unpredicted branch. It's 10 in Pentium III, Pentium M — 12, and (for comparison) in Pentium 4 — from 20 to 30 depending on a model. As we can see, the new CPU belongs to short-pipelined processors, which is an indirect proof of its kinship with P-III/P-M. Deeper buffers that have to do with Out-of-Order execution (OoO), which is first of all conditioned by the requirement of a higher bandwidth of a processor because of the "wider execution gateway". Shared (by the two processors) L2 Cache with increased bandwidth; it can now have direct access to L1 Cache of the neighboring processor, in order to boost inter-processor interaction. Improved memory prefetch; improved memory disambigution. Advanced power capabilities are introduced. Finally, EM64T (x86-64) mode is added, which must have required considerable redesign of integer and address arithmetic functional units as well as wider registers and on-chip buses. The main innovations that influence the CPU performance will be reviewed below in the P-III/P-M microarchitecture analysis. Radical power saving technologies (we shall not dwell on them, as we are mostly interested in performance). The size and associativity of I-Cache and L1 D-Cache (each was increased to 32 KB with 8-way associativity) and L2 Cache (up to 2 MB, 8-way associativity). Significantly improved branch prediction that takes into account the experience of Pentium 4 design. Pentium 4 bus (but at a lower clock so far — up to 533 MHz). SSE2 instruction set is added to make P-M software compatible with the first generations of Pentium 4. Significantly accelerated operations with hardware stack. Micro-ops fusion during decoding instructions. This procedure consists in generating one operation (sometimes called macro-operation) instead of two MOPs, which contains two elementary actions. The macro-operation is split into these actions at final stages of the pipeline, before executing them in corresponding functional units. The fusion procedure is implemented for two instruction classes: Load-Op, when one macro-operation substitutes for MOPs of reading from memory and executing an operation; and Write, which substitutes MOPs of calculating an address and writing an operand directly into memory. The main positive effect of introducing this procedure is the increase of bandwidth of the instruction decoder as it's implemented in P-III/P-M processors as 4-1-1: out of three simultaneously decoded x86-instructions only one (in the first channel of the decoder) can generate more than one MOP (up to four). Micro-ops fusion for Load-Ops and Writes allows to turn them into simple instructions, processed in all decoder channels, and thus increase the efficient work executed per clock as well as to reduce the number of cases, when a decoder does not work at full speed. This fusion procedure resembles a similar procedure in AMD K7/K8 processors, when any macro-operation may contain Load-Op (Write) or an action. The improvements listed allowed significantly increased performance in P-M versus P-III, which ensured its success in mobile computers (together with its drastically reduced power consumption). However, P-M retains the main drawbacks of its predecessor: the low potential of clock growth (probably lower than in AMD K8 processors) and the lack of EM64T (x86-64), which is tricky to introduce without a significant overhaul of decoders, all MOP stages, and functional units of integer and address arithmetic. The last Pentium M representative is expected in the nearest months — dual core processor, codenamed Yonah, with shared L2 Cache. This feature makes it related to the future Merom/Conroe processors, but that's where their similarity stops. Thus ends the epoch of P-III/P-M processors in the mobile sector. However, these families become a base for our analyses and comparisons with processors of the new architecture. Now let's proceed to this analysis. So, let's analyze the P-III/P-M architecture in order to understand what changes might have been introduced into it to raise performance and implement characteristics and features of the new architecture, presented at IDF. 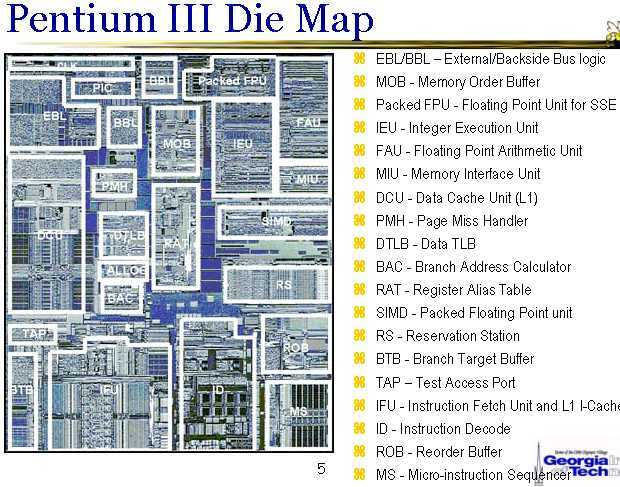 The illustrations above show the P-III functional diagram and the layout of units on a die (CPU variant without L2 Cache). Let's examine some P-III and P-M sub-systems, which seem the most critical for increasing the clock, performance gain, and new functionality. Branch prediction performs two main functions — to predict a program address of an instruction to jump and to predict a branching direction (for conditional branch instructions). Both predictions must be done ahead of time — prior to decoding and processing the branch instruction — so that the new block of instructions was fetched without extra clocks or with minimal losses. We shall not review prediction algorithms for branching directions (Intel has accumulated vast experience here). Let's have a look at the Branch Address Prediction and Fast Fetch. This prediction is necessary because this address can be extracted from an x86 instruction and calculated only at the final decode stage, delayed for several clocks. This mechanism is straight-forward in P-III processor, it's based on Branch Target Buffer (BTB) - 512 elements organized like a cache in the form of 128 sets with 4-way associativity. For addressing a set, b10-4 bits of the supposed branch address are used (of its last byte, to be more exact). You can see that a BTB element corresponds to one aligned 16-byte block of instructions — that's the size of prefetch from I-Cache. Thus, there is no need to know the exact address of a branch instruction to make a prediction (it's not yet decoded by that moment) — the prediction can be made by the whole 16-byte block of instructions. This procedure is identical to the one later implemented in AMD K7 (that was mistakenly called "innovative"), but it's more simple as far as algorithm is concerned, without preliminary I-Cache marking and preparation of a selector array. This procedure has the same temporal characteristics as AMD K7/K8, it loses at a branch just one clock, which can be easily hidden even in the tight instruction flow. This procedure allows to predict up to 4 potential branches in the aligned 16-byte block (AMD K8 allows only 3 such branches in a block). Thus, the existing procedure can be recognized as quite satisfactory. Its possible flaw lies in a lot of work per clock (though it's hard to give sharp estimates here). Besides, the new processor may require to increase prefetch to 32 bytes, as 16 bytes may be not enough for 4 instructions (taking into account a possible REX prefix for the new 64-bit instructions and active usage of relatively long SSE instructions). It's also desirable to enlarge BTB from 512 to 2048 or even 4096 elements (like in Pentium 4). There is just a chance that the BTB is already larger in P-M than in P-III. The processor contains a "direct" decoder without predecoding instructions prior to putting them into I-Cache (like in AMD K7/K8, for example). Marking (finding the start and the end bytes of instructions) is performed dynamically, at the first clock, right after fetching a block of instructions. Decoding is done in three parallel channels (which will be later referred to as "decoders" for simplicity) according to the asymmetric 4-1-1 scheme: the first decoder can decode instructions, generating up to 4 MOPs, the other two — generating only one MOP. Besides, decoders can work at full speed only with x86 instructions not exceeding 7-8 bytes. These limitations may slow down decoding in some cases to two or one instruction per clock. Strictly speaking, the decode scheme should have been called "4-1-1 / >4", meaning that in case of an instruction generating more than 4 MOPs, only this instruction will be processed. In this case, AMD K7 decoder should be designated as "1-1-1 / >1", as it becomes sequential for a 2-MOP instruction already. We should elaborate here: "1 MOP" in the AMD K7/K8 processors may mean Load-Op. In AMD K8, the decoder becomes "2-2-2 / >2", since it can process all packed SSE and some other 2-MOP instructions in all decode channels. In case of the P-M processor, "1 MOP" may also mean Load-Op and some other instructions with two elementary actions due to micro-op fusion. However, a packed SSE instruction generated two MOPs and thus must be always processed by the first decoder. Besides, SSE instructions like Load-Op are still split into separate Load and Op MOPs and are also processed by the first decoder (packed SSE instructions like Load-Op are split into 4 MOPs). Thus, the P-M decoder, being more flexible in some cases than in AMD K8, has serious limitations in decoding packed SSE instructions and SSE instructions addressing an operand in memory. Besides, it seems too complex to implement, which results in a longer clock and a limited CPU clock frequency. The most complex element in the P-M decoder that makes a principal difference from the AMD K8 decoder is an x86 instruction length decoder. It must mark three incoming instructions prior to sending them to decode channels. Complexity of this instruction length decoder grows, as the number of channels in the new processor is increased to four as well as due to the REX prefix of 64-bit operations and lengthening of the average instruction. We can assume that this chain will be split into several pipeline stages in the Conroe processor. Or there will be introduced an instruction predecode procedure before moving them into I-Cache. Each of these two approaches has its pros and cons. Redesigning decoder in the part where it marks instructions would allow to reduce the volume of work, executed at critical stages of a pipeline, and thus to increase the clock threshold. Does the new processor need a symmetric 4-4-4-4 decoder, or at least a 2-2-2-2 one? It depends on whether there will be changes in the SSE instruction decode scheme and in the organization of generated micro(macro)operations for these instructions as well as in the speed of functional SSE units. If there are no significant changes in this part, the decoder would have to be expanded to "2-2-2-2" or "4-2-2-2" (ideally "4-4-4-4"), in order to provide MOPs for SSE FPU at maximum speed possible (considering the gateway to execution increased to four). However, there is less need for a complex symmetric decoder, if SSE micro-op fusion is introduced in this or that form (for example, if appears a single 128-bit MOP for packed SSE instructions instead of two 64-bit ones). We can assume that the decision will be based on complexity of the decoder scheme and its power consumption. Theoretically, there should be no special problems to implement four "complex" decoders, from the point of view of marking instruction boundaries and their layout. x87-FPU is currently implemented in P-III/P-M less efficiently than in AMD K7/K8 processors: fmul and fadd instructions are started via a single shared port, fmul is executed at half-rate (but in this sense, x87-FPU is balanced by port and rate for the equal number of addition and multiplication operations). Scalar SSE mode (32-bit SSE1) is rather efficient in P-III: mulss and addss are full-clock instructions and are run from different ports, which provides the total execution rate for such instructions of two per clock. Probably the scalar SSE2 mode (64-bit) is implemented in P-M in the same way. Thus, we have no gripes against FPU for scalar SSE modes. However, the lack of micro-op fusion for scalar SSE instructions like Load-Op introduces limitations at the decode stage and reduces the MOP stream density at other stages. The situation with packed SSE instructions is still worse (see the previous section). Thus, in order to increase performance, SSE requires at least MOP upsizing (connecting two 64-bit operations into one 128-bit operation) for packed instructions. Besides, micro-op fusion for Load-Op is also desirable, or at least expanding a decoder to X-2-2-2, so that such instructions wouldn't slow down the decode rate. The radical performance gain could have been obtained in case of the double-width full-clock 128-bit (2x64) FPU instead of the current single-width 64-bit one. In this case all packed SSE instructions would become single-MOP. This option also requires 128-bit operation of loading XMM-register from memory (cache) — such an operation would be useful, even if the 64-bit FPU is retained. However, the decision will probably be again based on the scheme complexity and power consumption of the new FPU. At least one more integer execution unit and a corresponding port should be added for executing codes without floating-point arithmetic. In this case we may reach the full (or nearly full) bandwidth proceeding from the "3 integer instructions + 1 Load-Op" scheme. The number of execution ports for floating-point arithmetic is sufficient both in case the current FPU bandwidth is preserved (two 64-bit ports for multiplication and addition instructions correspondingly) and in case the FPU is expanded to 128 bits (FPU remains full-clock). The option with doubling 64-bit FPUs (and increasing the number of FPU ports) looks unpractical. 4 x ALU ports, one of them is shared with FPmul, another one is shared with FPadd. The last option looks the most preferable. However, it requires adding another (the fourth) integer arithmetic unit. Note that the new processor offers 64-bit integer arithmetic, meaning higher complexity of units compared to P-III/P-M processors. There is also an option to add an additional port for 64-bit Load-Op, but expanding the existing port to 128 bits looks a simpler alternative (to load XMM registers). This expansion is necessary in case of the double-width full-clock 128-bit (2x64) FPU instead of the current single-width 64-bit one (due to the doubled necessity of FPU in data). But it may prove useful even if the current 64-bit FPU is retained. Instruction and data caches in P-M processors (32 KB each, 8-way associativity) look quite efficient and sufficient for the new processor. Of course, we'd like to have D-Cache increased to 64 KB. But it would have required increasing the associativity level to 16 (cache indexing by the logical address would have been still required), and an effective design of this scheme may prove to be a difficult task. To increase the data reading rate (especially when the full-clock 128-bit FPU appears), 128-bit reading from cache is desirable, that is the read port should be expanded from 8 to 16 bytes. Two 8-byte read ports are possible instead, as it's implemented in AMD K7/K8 processors — but this option looks more complex. L2 Cache in the P-M processor also looks very good in terms of access times, data rates, and physical density. Theoretically, the current maximum reading bandwidth from L2 Cache (32 bytes per clock) is enough to provide data to both L1 Caches in the dual core configuration (with proper pipelined access). 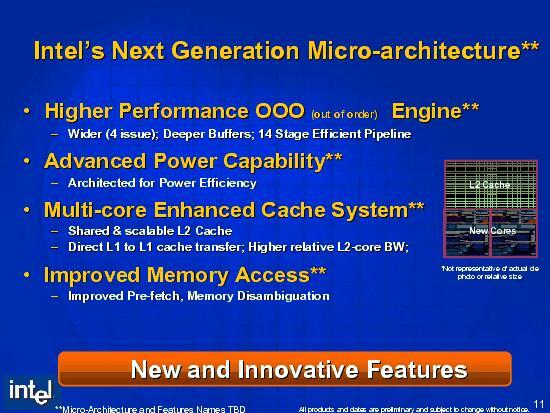 The desktop Conroe processor is supposed to have 4 MB L2 Cache. 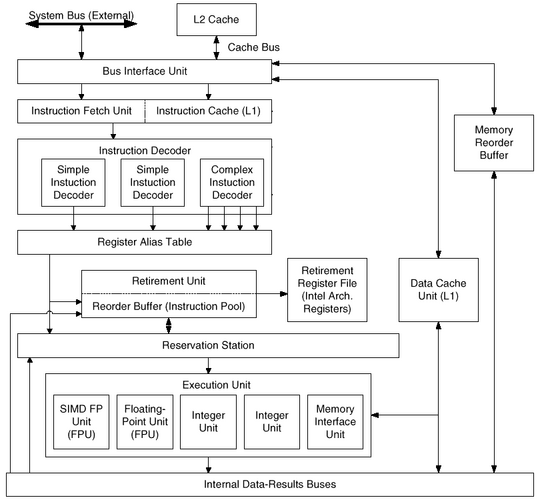 Introducing Trace Cache for instructions (like in Pentium 4) does not look efficient and justified for this relatively low-clock architecture, as it would have required a full overhaul and a significant complication of the core structure. Prefetch and branch prediction in Intel P-Pro/P-II/P-III/P-M processors as well as predecoding in AMD K7/K8 processors demonstrated that classic instruction caches still had reserved in this sphere — especially considering the simplicity of I-Cache, which is important for reducing power consumption. Improved prefetch from memory and advanced memory disambigution will certainly allow to raise reading rates from memory hierarchies and increase calculating performance of "high-bandwidth" programs. Higher FSB clock will also see to that (up to 1066 MHz in Conroe). Shared L2 Cache as well as fast access to L1 Cache of the other processor will allow higher execution efficiency of interacting processes. It may give a powerful incentive to the development of parallelism in desktop applications. Merom/Conroe processors stand out in such features against the current dual core modifications of AMD K8 X2. So, we seem to have underestimated Intel P6 microarchitecture — especially considering its development in P-III and (in the highest degree) P-M processors. Of course, it's still not perfect enough for tomorrow's requirements. But it can be used as a basis for a new or deeply modified architecture, which would demonstrate good performance results and low power consumption. "Each pipe is a full pipe versus the old P6 derived simple and complex pipe structures". We may consider it as a hint at the symmetric decoder (4-4-4-4 configuration). "The number of ALU ports are greatly increased also". This one hints at the addition of at least two new execution ports (that is four universal ports, two of which will be supposedly shared with FPU). "In addition, Merom has Macro-Op fusion, the ability to gang x86 operations before decode. As an example, if you have a multiply followed by an add, Macro-Op fusion can turn that into a Multiply and Accumulate". This one is the most incredible. It means that consecutive multiplication and addition instructions (supposedly SSE FPU instructions) are merged at the decode stage into a FMA macro-operation (FPmul+FPadd). This fusion may increase the MOP density along processor paths. 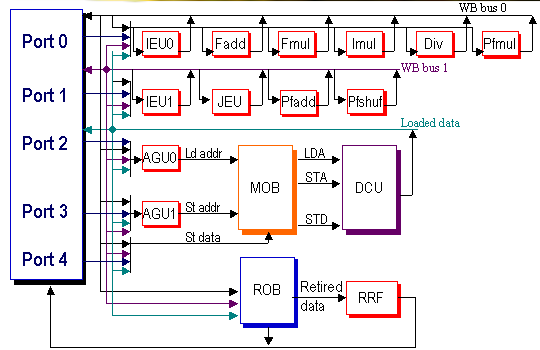 But the main gain could be achieved in case of the combined FPU that would allows to run this merged instruction at each clock (such solutions were widely used among RISC processors — for example, IBM POWER 4/5 and Power PC 970, HP PA-RISC, Intel Itanium, etc). In this case it might mean, for example, two 64-bit full-clock FMAs (one for each FPU execution port) with total peak FPU performance of quadruple clock frequency (versus the doubled clock frequency in P-III/P-M processors). Doubling the width of the full-clock FPU to 128 bit besides the above said is unlikely, as it would have caused excessive complexity and imbalance of a processor. This option requires either increased reading rates from L1 Cache, or two 64-bit reading ports, or an expansion of the existing port to 128 bits. In the last case, a good balance between load rates and instruction execution speed may be reached only with packed SSE instructions. Theoretically, the fusion of multiplication and addition instructions might be accompanied by the fusion of two operations of a packed (macro)instruction into a single MOP and/or by the fusion of Load-Op (macro)instruction. On the whole, this information does not seem quite credible, this scheme looks unlikely. Creating two full-clock 64-bit FMAs instead of the existing FPmul and FPadd units would require to add addition schemes to the first unit and multiplication schemes - to the second. The multiplication unit is the most expensive here. But on the other hand, this option would be simpler and more economic than full-clock doubled (128-bit) FPmul and FPadd units — with all that in mind, it would allow the same peak FPU performance, without being too much inferior in "irregular" operations (in a number of cases even outperforming it — for example, in case of scalar SSE instructions). The fusion of multiplication and addition instructions into a FMA macro-op poses another problem. Usually after a multiplication, the result with a long mantissa is immediately, without preliminary rounding, added to the operand. It allows to execute a combined operation in the most efficient way. Unfortunately, such an optimization is impossible in our case, as you cannot be sure that a neighboring pair of multiplication and addition instructions will always fuse into a single MOP, when executed dynamically (the process may be prevented by interrupts or other circumstances). As the lack of determinism in binary code execution is inadmissible, we'll have to always round the multiplication result, which will lead to one clock lost at the minimum. However, this requirement does not interfere with the efficient FMA operation in the new processor. Intel Advertisement. According to IDF presentations, Conroe's performance per watt is approximately 5 times as high as in Northwood and Prescott processors, and 3-3.5 times as high as in the dual core Smithfield. Hence we can draw a rough estimate that its advantage in terms of absolute performance will be 2.5-fold (two processors versus one) and 1.5-fold (two versus two). That is each CPU core inside Conroe (3 GHz) will be 1.25-1.5-times as fast as Pentium 4 Prescott (3.2-3.8 GHz). Perhaps, this assessment belongs to the most advantageous test for Intel — that is to SPECint_base2000 (not to SPECfp_base2000). Pentium M Performance Tests without Taking into Account Architectural Innovations. In case of a dual channel DDR2-533 memory controller, Pentium M (2.26 GHz, 533 MHz FSB) offers the following performance: SPECint_base2000 — 1812, SPECfp_base2000 — 1355. Thus, the expectable performance (roughly estimated) of a hypothetic Pentium M processor at 3 GHz, 1066 MHz FSB, and 2 MB L2 Cache in SPECint_base2000 is about 2200-2300, in SPECfp_base2000 — about 1800-1900. Architectural Enhancements. They are the most difficult to evaluate. The effect from some innovations may amount to fractions of a percent. Probably, the wider execution gateway and the improved decoder may yield a certain effect for integer applications — about 10 percents or a tad higher. If the obstacles for SSE instructions are lifted (due to the improved decoder and/or fusion of Load and Op micro-operations), it may produce the 5-10% effect on floating-point applications. When switched to EM64T (x86-64) mode, another 10% may be gained. Thus, we can expect the following performance from a single CPU core within Conroe 3 GHz, 1066 MHz FSB, and 2 MB L2 Cache (half of 4 MB for each core): >2500 in SPECint_base2000 and >2200 in SPECfp_base2000. Additional performance gain in floating-point arithmetic can be achieved in case of full-clock 128-bit FPU or two 64-bit combined FMA units and multiplication/addition fusion. In this case we can speak of SPECfp_base2000 at the level of 2400-2500. The performance rates published for integer applications demonstrate approximately the 1.4-fold performance gain versus Pentium 4 3.8 GHz, which agrees with the advertised assessments. In case of floating-point applications, the performance is evaluated at the level of Pentium 4 XE 3.73 GHz, if FPU is not enhanced, and higher by 10-15%, given the peak FPU performance is doubled. Approximately the same ratio is demonstrated by Conroe core (3 GHz) and AMD Athlon 64 FX 3 GHz (this processor should appear in the nearest year). Peak performance with floating-point and Linpack-like benchmarks. Given the current FPU structure is preserved, Conroe core (3 GHz) will be outperformed by Pentium 4 (3.8 GHz) in Linpack-1000 approximately by 10-15%, it will reach 4 GFLOPS or a tad higher. If the peak FPU efficiency is doubled, the new processor may shoot forward significantly in this test — up to 1.5 times, reaching 7 GFLOPS. But you should note that this test does not reflect CPU performance in real tasks, it's intended for a peak potential demonstration. So, Intel seems to take the challenge of time, "trod on its throat", and designed processor architecture intended "not to set the Thames on fire", but to satisfy users' needs. Exactly in the way the users (and Intel, copying them) imagine it. Now Intel and its processors will be hard to reproach with performance loss in heavy games, with high power consumption and heat dissipation, with the lack of competing dual core solutions, with unjustified passion for technologies of tomorrow. Of course, the public will soon find another reason for unfair criticism. However we must admit that Intel struck back its opponent with its own style and offered products with good characteristics in all "advantageous" (for its competitor) directions. Moreover: if the results of the above analysis are correct, we'll have to admit that Intel will get advantage in most characteristics (probably, except for floating-point performance). It means that the competition must become more sensitive. AMD will have to get out of its "design hibernation" to offer back decent solutions. That will play directly in our hands. Of course, it's a pity that NetBurst will start leaving desktop computers in a year. This architecture appeared ahead of its time. And unfortunately, it was not evaluated fairly. If we call in the aid of our usual Russian analogies, we can say that our roads failed us once again. But the roads (to be more exact, software quality) will not always be so bad. Sooner or later the interest to high-clock long-pipeline architectures will return. We have been seeing the battle between "thick low-clock" and "thin high-clock" architectures for some time already — the entire history of RISC processors is full of such examples. What's more important is that architectures haven't stopped in their development. After the clock frequency threshold was reached, we had an impression that Intel and AMD struck a contract and decided not to modify seriously their architectures any more. Indeed, micro processing technologies are "overforced", it's quite possible to make a pause in their development. Fortunately, it didn't happen — let's hope it won't happen in future either. Especially as there are still reserves (such as speculative decoding of instructions along several directions). Who knows, may be electronic technology will have a break through for us to see the clock frequency growth again? Our life will become more interesting then. So, let's hope that our brave and optimistic assumptions will be backed up, while cowardly and pessimistic ones will not be confirmed. Let's wish good luck to AMD as well. As a result, we shall all be all right :). IA-32 Intel Architecture Optimization Reference Manual. Intel, 2005. IA-32 Intel Architecture Software Developer's Manual. Intel, 2005. S. Gochman et al. The Intel Pentium M Processor: Microarchitecture and Performance. Intel Technology Journal, V.7, Issue 2, 2003. J. Keshava, V. Pentkovski. Pentium III Processor Implementation Tradeoffs. Intel Technology Journal, V.3, Q2, 1999. Intel Architecture Optimization Reference Manual. Intel, 1999. H.H. Sean Lee. P6 & NetBurst Microarchitecture. School of ECE, Georgia Institute of Technology, 2003. O. Bessonov. Pentium 4: Mystic and Enigmatic Trace Cache. 2005. S.L. Smith, D. Perlmutter. Intel Next Generation Multi-core Platforms. Intel Developer Forum, 2005. C. Demerjian. Intel Merom is designed from the ground up. The Inquirer, 23.08.2005.